Just an hour-long ferry ride from the port of Long Beach lies Catalina Island - home to just over 4,000 people, approximately 150 bison, and not too much else. But that's what makes the largest of the Southern Channel Islands so special - the quiet harbor town of Avalon is both quaint and welcoming with colorful storefronts and open-air restaurants, and golf carts whizzing down the town's streets in place of cars and trucks. The town itself is small enough to be seen in a day, though there are plenty of inns and bed and breakfasts that invite travelers hoping to stay on island time for a tad longer. 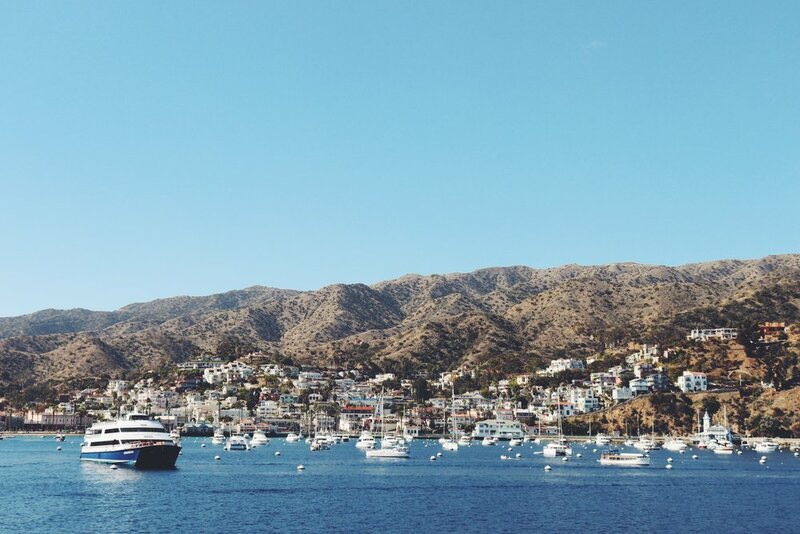 Whether for a day trip or weekend adventure, Catalina is a gem of Southern California not to be missed! We took the Catalina Express from Long Beach to Avalon, a trip that cost about $75 per ticket (round trip) and took just slightly over one hour. There are multiple departures daily, and the company operates to two ports on the island: Avalon and Two Harbors. Avalon is the largest town on the island, whereas Two Harbors is a small unincorporated community of less than 300 people, popular with hikers heading out to one of the inland campsites, or perhaps tackling the trans-Catalina trail. Avalon is by far the most popular harbor on the island, with the most to see and do! To explore Avalon beyond the town center, rent a golf cart! The rental price is a tad steep ($45 for one hour), but with a group of four, like we had, it was easier to justify. We rode with Catalina Island Golf Carts, and they were wonderful - they provided a map for us to follow and even gave us tips on where the most photogenic viewpoints are. We thought it was time and money well-spent, glad that we were able to see so much more of Avalon than we would have on foot. If Catalina is famous for one thing (beyond, perhaps the suspicious death of Natalie Wood or The Catalina Wine Mixer), it's likely the Art Deco architectural icon known as "the casino." Actually not a casino at all - at least not in the way most of us likely think of it - it's an operating theater, and also home to the Catalina Film Festival. A historic relic from the late 1920s, the building and the tile artwork decorating the casino's entrance is something to behold. For those who want the full experience, guided tours of the casino are available twice daily. We ended our day with a beer at Catalina Island's only brewery - or as they call themselves, "nano brewery." The Catalina Island Brew House is primarily a brew pub, but is a bit of a grab bag in the fact that they also serve coffee, pastries, and pizza. We sipped our beers as the sun started to set on the other side of the island and the cold of the open Pacific ocean at night started to set in. In the distance, we could see the Catalina Express approaching the harbor to take us home. As we boarded the ferry to head back to Long Beach, we all agreed it was a wonderful day trip. We had ice cream twice, ate fish near the pier, and watched the boats bob in the harbor as we walked the coastline to the casino. We zipped around in a golf cart for an hour, and met (and petted) lots of local dogs. But I felt like I left Catalina having only seen one tiny corner of the island, and in fact, that's true. So, sometime soon, I'm planning to backpack the trans-Caralina trail - another new adventure to look forward to!